Perfectly divine, this darling dog will capture every heart in the room on this delightful Shih Tzu Paw Wipe Towel. Your beautiful hairy companion will astound on this 13 x 18.5 inch machine washable towel finely made from White Terry Cotton. It also comes with a Hook & Grommet for hanging anywhere in your home, car, boat or any place that you bring your best friend. 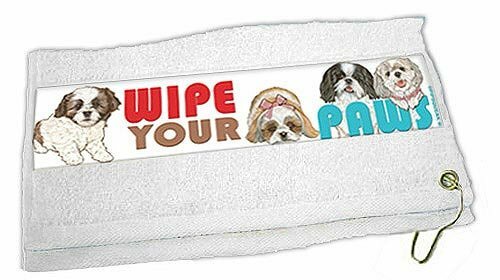 Our Shih Tzu Paw Wipe Towel is an adorable gift idea that friends will be excited to use for several years. Maxtore Deodorizing Dog Wipes For Dogs & Puppy & More Small Pet Deodorizing Pet Grooming Bath Wipes & Paw Wipes Cleaner For Daily Use. Honey & Spring Flavors. Include Thematic Bonus. DOG BATH IN A PACK - Largest Bath and Grooming Dog Wipes - Individual PacksNEW Perfect for Travel or When on the GO 20ct.